What a show … even if I do say so myself! 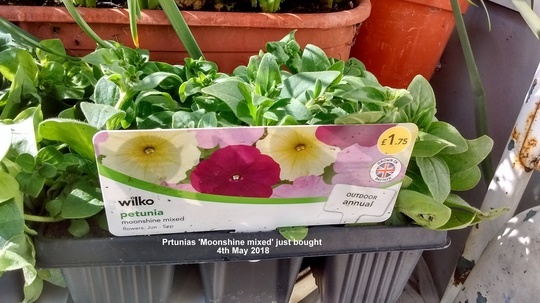 My wife & I bought some packs of Petunias in town just before the Early Spring Bank Holiday, (7th May), which were part of a special Bank Holiday weekend offer – 4 packs for £3! 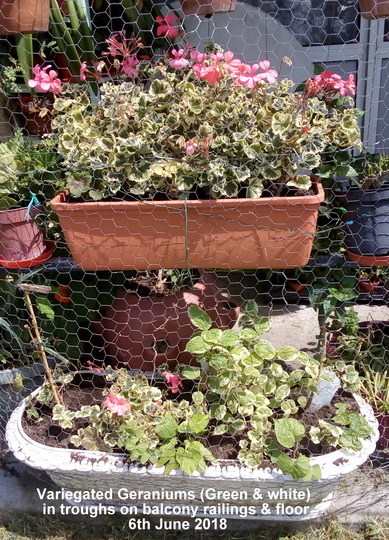 So we got 3 packs of Petunias & a pack of Dark Begonias. 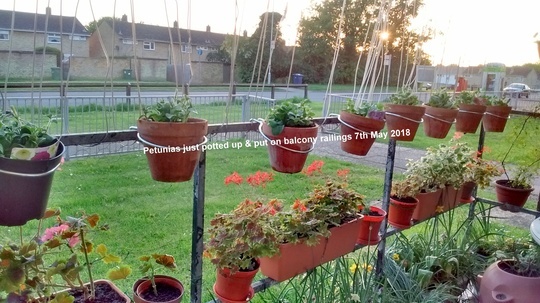 I put the pots, 2 plug plants to a pot, out on the balcony railing on the Bank Holiday Monday. 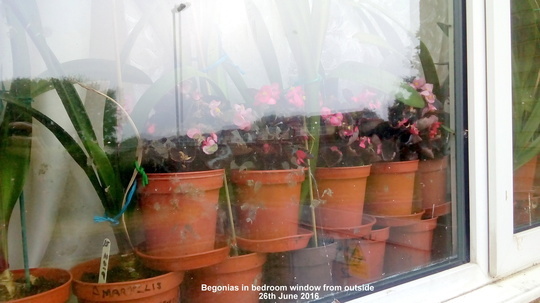 As there were 6 plants in each pack & I had 9 pots I was able to group them according to their colours in groups of 3! Later on my wife decided they would look better if the colours were mixed up! So I had to break up the groupings of colours which made it more difficult to photograph them in the following months! I don’t have a more recent photo because, (as you can see from the last one I took), there is too much glare on the windows which makes it almost impossible to get a half decent photo! 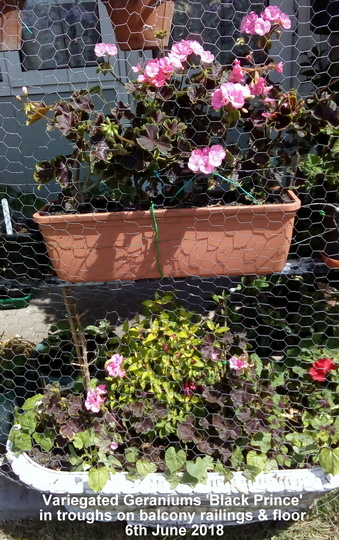 As I had a lot of Geraniums that I’d overwintered I thought I could put them to good use by putting them in the new troughs I had bought, to take the place of the old ones which were falling to pieces. 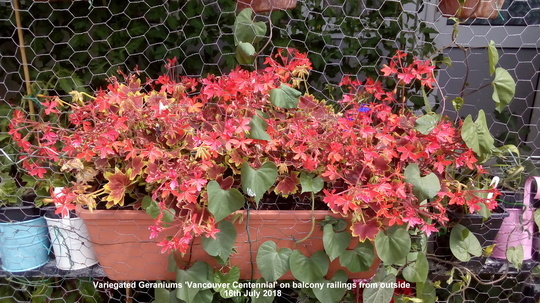 I put the same variety of Variegated Geranium in each of the troughs & then repeated the same ones in the long white troughs below them on the balcony floor. If you’ve reached this far down then I think you deserve to see what the title of this blog is all about! So, if you are ready? Then let’s lift the curtain & not have any more suspense! 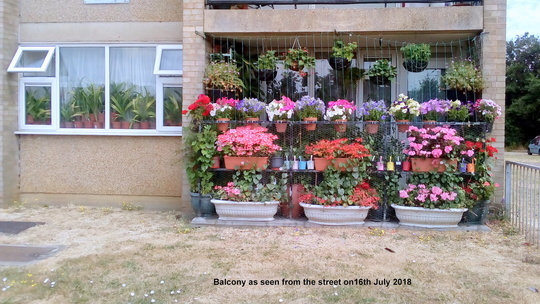 What you can’t see from the above photos are the many tomato plants growing on the balcony! Hope I haven’t bored you with this show! But … the show must go on! 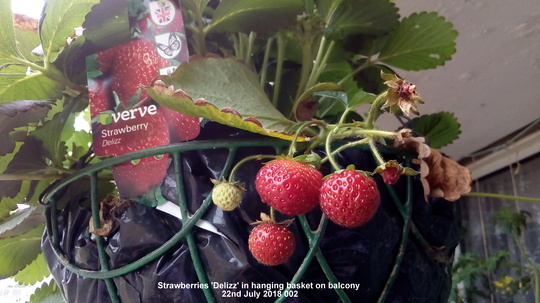 So another time I’ll do another blog on our balcony – with a different perspective! Wow it certainly is a fabulous show !, Must have taken a lot of looking after in the heat we've had and unlike mine not a crinkley brown leaf in sight , gorgeous ! You can be justifiably proud of that lot! What difference it makes to the row of flats - you would be sorely missed if you moved house! 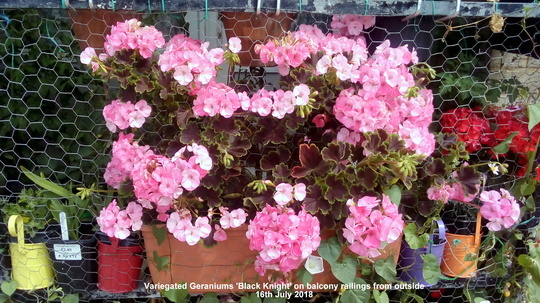 Absolutely love Geranium Black Knight - when you take cuttings can I be cheeky and beg one? Must show you a pic of my Red Robins when I get round to it - they are doing very well and i think about you every time I see them! What a great show. I can see that it would also work for disabled people who need easy access. 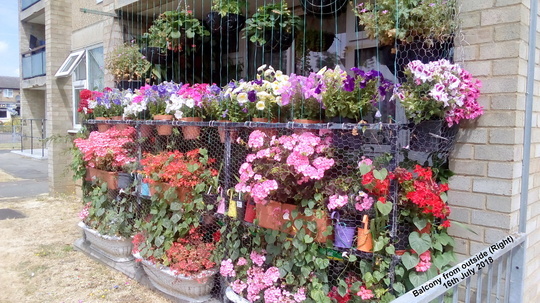 What a flower show. Really impressive. Simbad, if you can't see a crinkly leaf anywhere it's because they were burnt off or are hidden beneath the foliage & flowers (in the case of the Geraniums!). 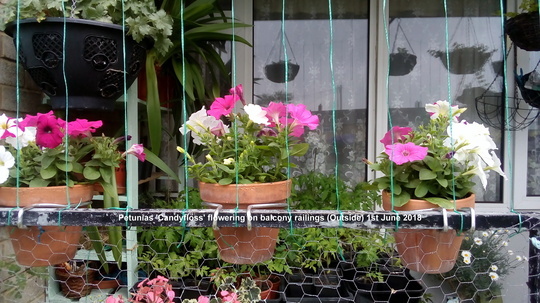 Fortunately the Petunias don't seem to have minded the very strong sunshine & the high temps for day after day & week after week! They get the sun from about 11am till it goes down in the evening which is a lot of hours putting up with it! 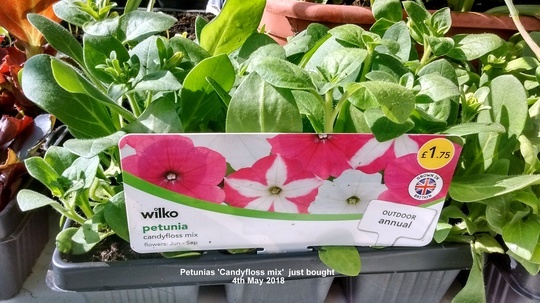 On at least 2 occasions my Petunias got so dry that I thought I had lost them! 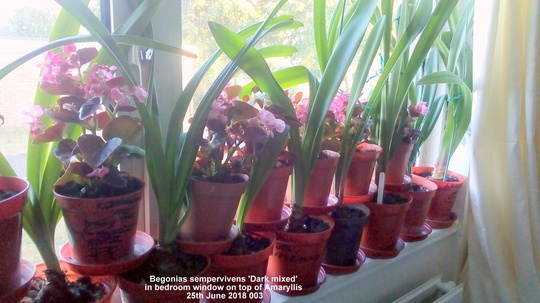 I have had to water them twice a day for weeks on end as all, except one, are in terracotta pots so dry out very quickly. The Variegated Mock Orange has had all its leaves burnt off as well. There were a few shoots that appeared after I cut the dead branches back to almost soil level but I saw they were beginning to look scorched so I put a sheet of white paper around the plant to give it some protection from the strong sun. They seemed to be resisting for a time but they are still looking very bad & may not make it through to the autumn. Stera, of course you can have a cutting! 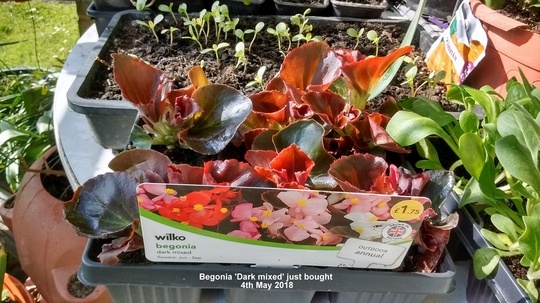 It grows very quickly form a cutting which roots in a couple of weeks with no special care! 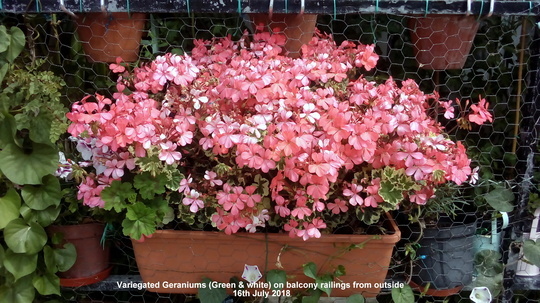 In fact the 3 Geraniums I mention all do the same! 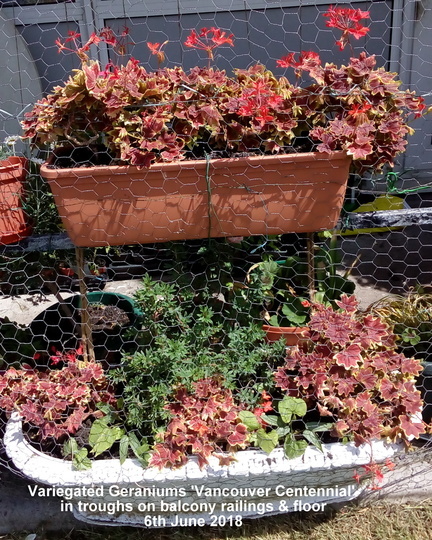 All the plants are grown from my cuttings! 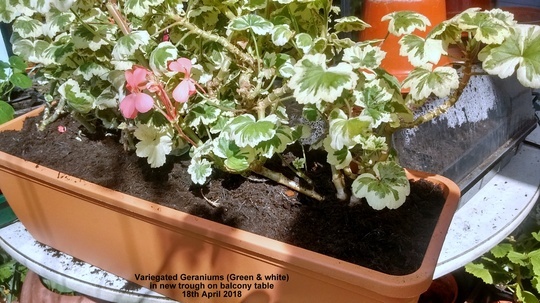 I haven't bought a single Geranium in many years - in fact the other two variegated ones came from a supermarket in town some years ago. I bought them on the spur of the moment - something I very rarely do! I put a couple of cutting in an envelope for you. BTW, the original cutting came from David, in Scotland. Like you I commented how nice they looked in a photo he posted & then he said he would send me a cutting! When it arrived I sent him an Amaryllis bulb. He said he had never grown them before. I'm glad to hear your 'Red Robin' tomatoes are doing well for you! My plants have lots of fruit & they haven't needed any more attention other than watering & feeding & removing an occasional dead leaf or two. 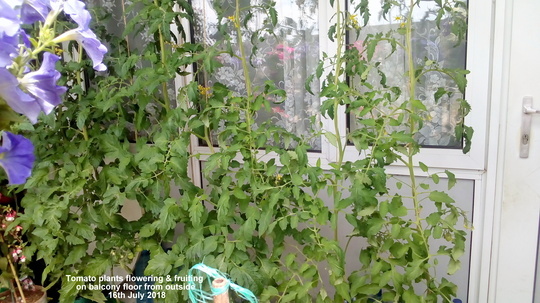 I have noticed this week that a few tomatoes are now starting to ripen! I'm looking forward to tasting the first ones! Hope you've had some rain at last Balcony we have ! I love the sun but it's been to much ,I can almost see the grass greening up before my eyes! 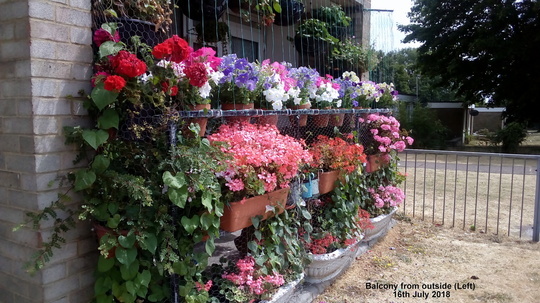 You've got the most colourful balcony in the world lol :) Well done ! It's surprising what can be done in such a small space. 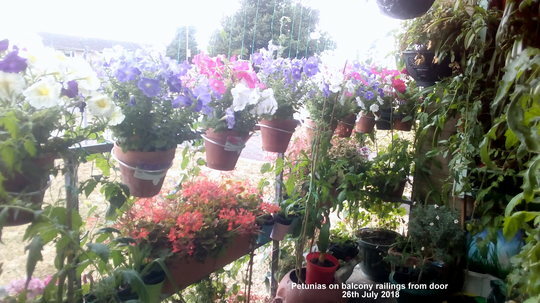 Shirley, yes I'm proud of it & very pleased at the way the Petunias have flowered so magnificently as well as the Geraniums that have flowered better this year than for many. Re the Red Robin - I was saying the other day there ahd been no slugs this year. Haha. After the rain I found a huge one munching its way through one of the tomatoes. Great work done there, Balcony. Flowers looking very colourful ! Added to GoYpedia. wow that is amazing. 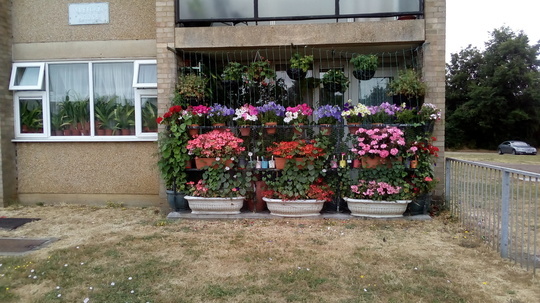 well done and a lot of watering to do every day. did the morning glory seeds germinate? 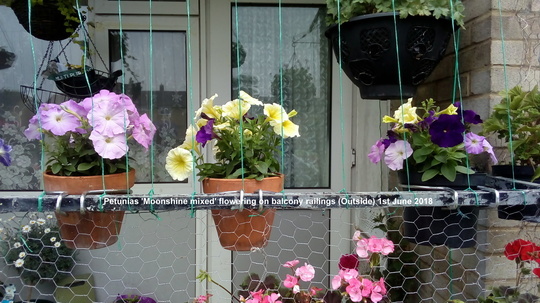 mine did eventually and I have some lovely flowers now. Stera, our two gkids spent the day with us on Tuesday & they got to pick all the tomatoes & strawberries that were ripe! There weren't very many but in the last couple of days many more have ripened so they can pick some more when they come again on Saturday! I'll put some cuttings in an envelope for you & send them soon. 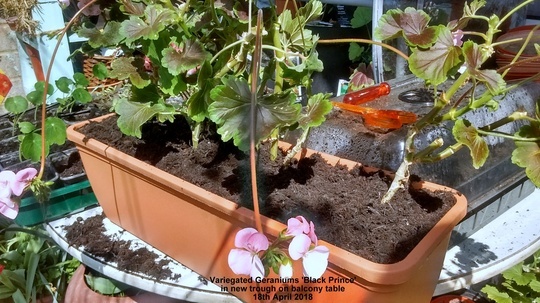 You were very lucky because the day after you asked we had some very strong gusts of wind & they broke a branch of the 'Black Prince' Geranium so I've divided it up into cuttings. Thanks, TT! Glad you like our balcony! Thanks for adding it to Goypedia! You are quite right, SB, it is a lot of watering! During the hottest weather twice a day! 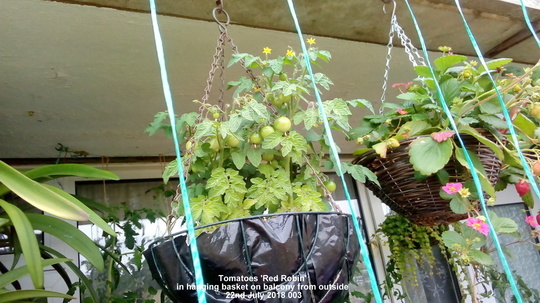 The tomatoes in growbags especially need a lot of water! As for the Morning Glory seeds you sent me, yes, they grew & are flowering now together with some my son brought me back from Spain. 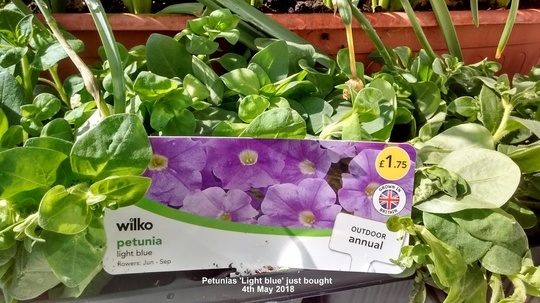 I'd also bought a packet of 'Heavenly Blue' seeds months before you send me any seeds & before my son brought me some. 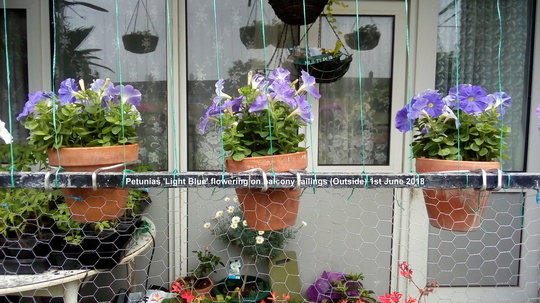 The most curious thing I've found this year is that the majority of the plants that have been flowering for the last month have mostly been white with some purplish markings at the outside edge! The are a few purple ones in flower as well but the 'Heavenly Blue' ones show no sign of flowering even now that some of the plants have reached 2m high! Also they are completely different form the others! They are a lighter green & almost hairless! I've grown them before but they have always flowered well so I don't understand what's the matter with them this year! 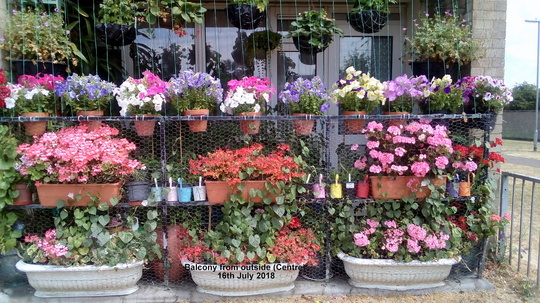 What a show indeed, fantastic, lucky neighbours, your Pelargoniums have done so much better than ours, which hated the tremendous heat. ......never had a problem with them before, have been growing them for over 30 years! so well done you!! Sorry for not replying to your comments earlier but I have been rather occupied of late & there have even been a couple of days during the last couple of weeks when I haven't even been able to turn the computer on! I have a couple of cutting rooted for you & I will try & post them to you tomorrow. Thanks very much TT for adding this blog to GoYpedia! SB, the 'Morning Glory' have been a real show & are in full bloom right now. 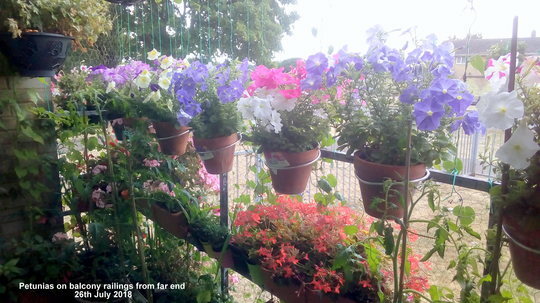 Thanks to the cooler weather of late the flowers are lasting longer & resist most of the day whereas during the hot spell they only lasted till about midday! I mentioned that the MG 'Heavenly Blue' hadn't flowered yet - well it has begun to at long last! 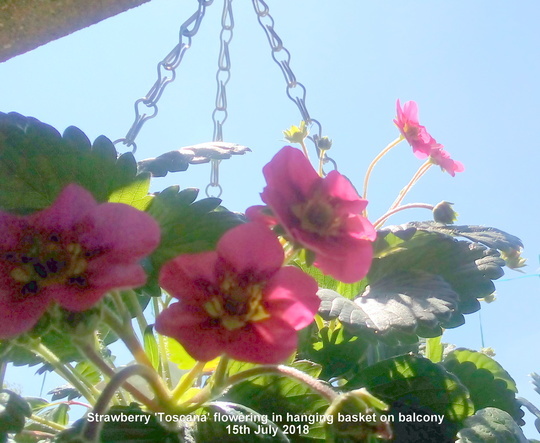 The 1st flower opened on 31st August only it was so high up I couldn't get a decent photo & in fact I didn't even recognize it as this until a couple of days later when 2 more flowers opened much lower down. There are plenty of buds& during this month they will soon be opening. 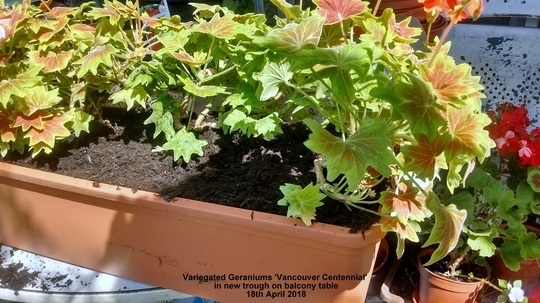 DD, sorry to hear about your Geraniums not liking the summer heat, it seems strange as after all they come from S. Africa, where the climate is hot & dry. Perhaps you will have better luck with them next year.